The Boao Forum for Asia showcases China’s dream of regional leadership on both economic and security issues. The 2014 Boao Forum for Asia held its opening ceremony Thursday in Boao, a coastal city in China’s Hainan Province. This year, the economic forum attracted a wide array of regional leaders. In addition to Chinese Premier Li Keiqang, attendees included Prime Minister Tony Abbott of Australia, Prime Minister Serik Akhmetov of Kazakhstan, Prime Minister Jung Hong-won of the ROK, Prime Minister Thongsing Thammavong of Laos, Prime Minister Xanana Gusmao of East Timor, and Prime Minister Nawaz Sharif of Pakistan, along with Deputy Prime Minister Arkady Dvorkovich of Russia and Deputy Prime Minister Vu Duc Dam of Vietnam. Former top government leaders from Japan, Malaysia, France, and the Philippines attended as well. In addition to the political leaders in attendance, the Boao Forum also played host to 150 executives from multinational corporations, from Chinese giants like PetroChina, Lenovo, and CNOOC to foreign companies like Apple, Toyota, Qualcomm, Volvo, Bloomberg, and Samsung. The Boao Forum is primarily an economic platform, as made evident by this year’s theme: “Asia’s New Future: Identifying New Growth Drivers.” The forum is explicitly dedicated to improving regional economic cooperation and helping Asian countries achieve their development goals. As such, the forum contains numerous industry-specific meetings, including meetings between business leaders and more academic panels on the future of the Asian auto market and energy security. Although the Boao Forum for Asia is technically a non-governmental organization, it has strong ties to Beijing. Besides the annual presence of top Chinese leaders such as Li Keqiang and (last year) Xi Jinping, the forum’s leadership is dotted with retired Chinese government officials. For example, the Secretary-General of the forum, Zhou Wenzhong, was a career member of China’s Foreign Ministry, and held the post of Ambassador to the U.S. from 2005 to 2010. While the Boao Forum’s board of directors is undeniably international, the forum is still viewed primarily as a Chinese-led organization. However, recently the Boao Forum has been moving beyond purely economic topics to discuss other regional issues. Given China’s leading role in the Boao Forum, the expansion of the forum’s agenda reflects China’s regional leadership ambitions. In 2013, the forum introduced non-economic topics to its agenda for the first time, including food safety and America-Asia relations (not coincidentally, those two topics are of major interest to Beijing). This year, the forum has expanded its scope yet again, with plans to include discussions on potential cooperation in South China Sea, a code of conduct for cyberpsace, and China-U.S. relations in the Asia-Pacific region. One of the major perks of being a global leader, as the U.S. has found, is playing an outsized role in determining which topics even come up for discussion at regional and multilateral events. In 2010, for example, China tried its utmost to prevent the South China Sea maritime disputes from being discussed at the ASEAN Regional Forum. However, due to U.S. insistence (and the fact that Vietnam was playing host), the South China Sea became one of the major topics of the meeting, much to China’s dismay. Chinese officials have raised similar complaints about the U.S. reshaping APEC to take on regional security issues rather than remaining a purely economic forum. Apparently, China has decided that “if you can’t beat ‘em, join ‘em” — and Beijing is now slowly turning the China-led economic forum into a platform for discussion on major regional issues. The U.S. has had success framing conversations on sensitive issues like conduct in cyber-space and how to handle the South China Sea disputes. By raising these same issues in its own forum, Beijing can set the agenda for a change. But Beijing seems to have even broader hopes for the Boao Forum as a regional dialogue. 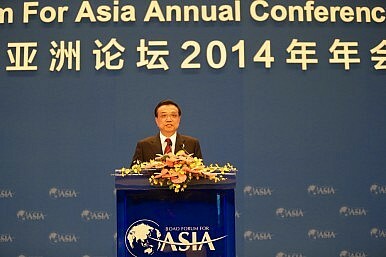 Li Keqiang, in his opening speech, recommended that Asian countries “should actively explore the establishment of a regional security cooperation framework in Asia.” Li’s speech also underlined China’s crucial importance to the Asia-Pacific economy, and urged closer economic integration within the region. In sum, Li repeated the Chinese call for Asian nations “to build a community of shared interests, common destiny and shared responsibilities,” in terms of both economics and security. Such a community would exclude the U.S. (a non-Asian nation) from a leadership role — and would necessarily highlight China’s influence as the largest regional power. In turn, the increasing influence of China-hosted regional forums (as shown by the growing number of government VIPs in attendance) shows that China’s regional leadership is, in fact, growing. In 2004, the Boao forum had to make do with only the Prime Ministers from Cambodia and Pakistan and a host of former government leaders, despite attendance by then-President Hu Jintao himself. by contrast, this year no less than seven Prime Ministers were in attendance, a clear sign of the rising prestige of the Boao Forum and China itself.